The Workflow Status form has the item type and the item key as the title. It lists the activity name, type, status, result, start date, end date, assigned user, error name, error message, error stack, activity internal name, activity description, and user name. You can use the folder tools to change the form to fit your needs (see Figure). 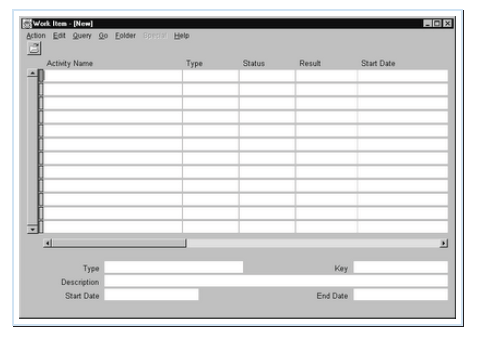 The process title shows the workflow process name, the item type internal name, and the user item key that identifies the item. These are the context values of the workflow instance. This shows the process diagram associated with the workflow process. This is for display only. Color is used to represent the state of an activity or transition. Green means active or in progress, yellow means suspended, and red means erred. A thin black transition means that the transition has not been visited. A thick green transition means that the transition has been visited. You may look at the subprocess diagram by double-clicking on any subprocess. Select the Detail tab to reveal the definition, usage, status, notification, and item of a node. The Definition tab shows the item type, display name, description, activity type, message, function, result type, any time-out parameters, cost, loop check, and error process. The Usage tab reveals performers and comments. The Status tab shows the status, result, begin date, end date, and any error information. The Notification tab provides recipient, status, begin date, and end date information. The Item tab discloses the item type, item key, item owner, begin date, end date, and item attributes. Administration buttons are only available if you are running in the ADMIN mode. These buttons allow you to abort process, suspend process, resume process, reassign process, or expedite process. Each button corresponds to an API call. You may select Attribute to change the value of an item attribute.